This is the mixture gently simmering. 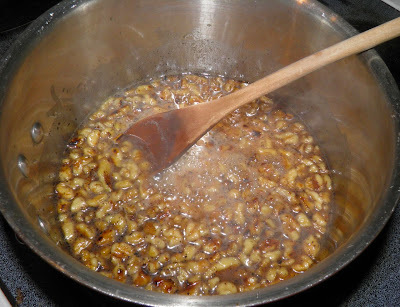 As promised, here’s my first update on making Baklava Liqueur. This recipe did not exist until now, so we’re all watching a birth. I made my infusion tonight so contractions have begun. This was my method. For the original recipe see yesterday's post. the effect of the flash on some of the nuts. I toasted my 200g of walnut pieces in a skillet until they just began to turn brown. In hindsight, I possibly would spread them on a pan and do it in the oven, but I started in a pan, so I finished in a pan. 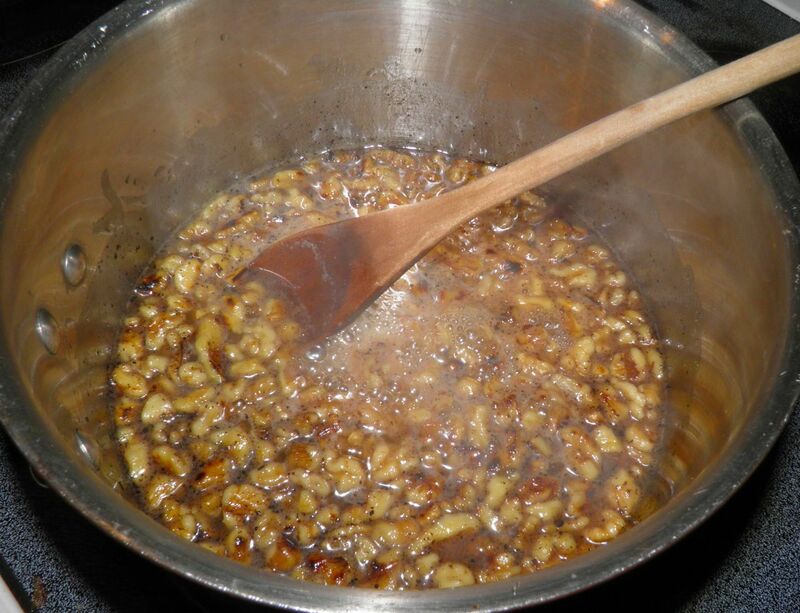 I combined the walnuts with 1 cup of water, 1 cup of honey, 1/2 a vanilla bean (scraped with seeds included) and about 2” of cinnamon. I slowly brought it to a boil while stirring and let it simmer for about 2 minutes. I didn’t let it simmer longer because the more steam, the less liquid. The end result (hopefully) will be close to 2 cups of infused liquid. The usual ratio is combining 2 cups of highly flavoured liquid with 2 cups of vodka. Since vodka is 40% alcohol by volume your resulting liqueur is reduced to 20%. Still potent, so one has to be careful. I let the liquid cool slightly and decanted the entire contents into a mason jar, sealing it tight. It is now residing in the refrigerator for one week. After the week, I’ll taste it and see if it needs more time. I have to admit I did lick the spoon. Unsanitary, I know but I couldn't help myself. It did taste quite a lot like baklava. 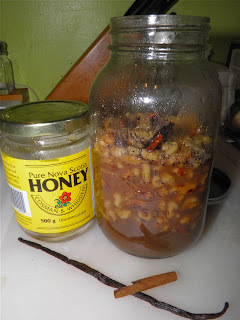 The mixture was slightly “nutty” but right now the honey and vanilla are front and centre. The cinnamon will come through stronger later, as will the walnuts as essential oils begin to leach out while it all infuses. A little cloudy now, but we'll fix that with straining. The liquid is cloudy right now. This may be due to two reasons. 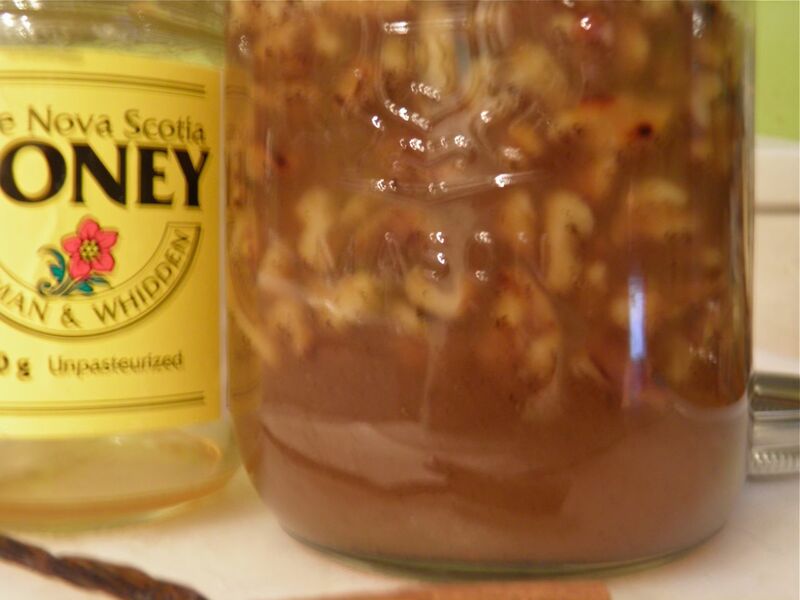 The first is small bits of nuts are suspended in the honey. The second may be the honey itself. I plan to counteract the cloudiness by straining it a few times through a pillowcase (or other very fine woven mesh) to remove as much residue as possible. So, that’s my update. Stage 1 is complete. I’ll be back with another update once I put in the vodka and take it for a test taste. If yo like this post retweet it using the link at top right, or share using any of the links below.